You know you have a winning recipe when you look over at your usually mild mannered husband and see him licking the plate! Yes, it’s true — he was licking the garlic sauce off the plate! Well, today’s recipe of Chicken Kiev fell into the category of “why have you not made this before? What has taken you so long to try this recipe?” Once again it was something that was a little bit of a pain to assemble, but the end result was well worth the effort! Chicken Kiev has a fond memory for me too. When I was in England for a year I had my first taste of really good Chicken Kiev. I was supposed to be attending a class, but a few friends and I cut for the evening — upon our return it was hard to hide the smell of garlic on our breath. It was well worth it then, and well worth it now. 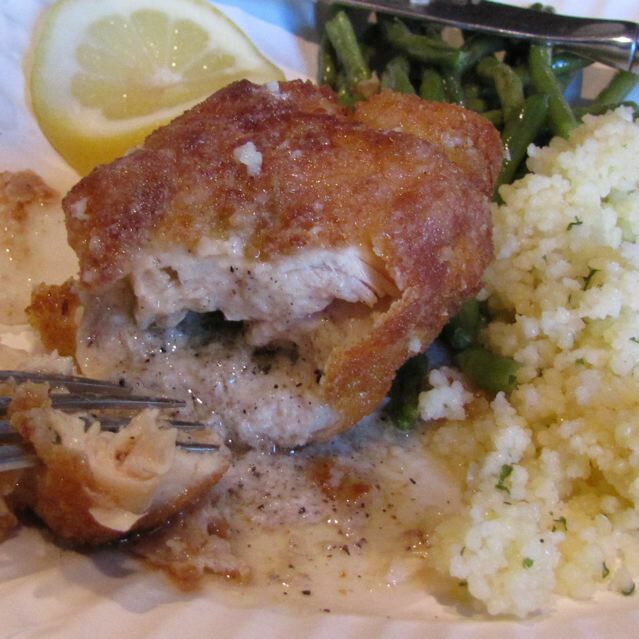 I have purchased the pre-made Chicken Kiev that they sometimes sell at the grocery store, but it does not come close to the goodness of this recipe. This one is a WINNER! I know at this point, I am gushing and you are wondering if I will be okay in knowing that we ate it all and that there is nothing left over… I will be okay.. my husband wants it for dinner tomorrow.. but I have a date with another family favorite: Avgolemono Soup (Chicken Lemon Soup). I used the thin sliced chicken breasts because I don’t like pounding chicken out thinly. It made for an easier process, but the slices are smaller than if you used the full breast and the garlic butter may be harder to put in, but it worked for me, so I will likely do exactly as I did this time. Make the flavored butter: 1 stick softened butter with 1/2 tsp black pepper, 1/2 tsp garlic powder, and 2 tsp garlic paste. Combine with a fork. Place 1/4 of the butter compound on a small strip of foil. Form into a “cigar” and then roll the foil around it to secure the roll and shape it. (I used the quick release foil and the butter was easy to remove from it later.) Repeat with the remaining butter until you have 4 butter “cigars” wrapped in foil. Freeze them for at least an hour. After the butter has frozen remove it from the freezer and open the foil. Cut the butter into two pieces. Place one chicken breast slice on the plate. Place the butter long wise in the middle of the breast. Roll the sides around it. Then fold the end pieces over the seam and secure with toothpicks. I found longer toothpicks at a kitchen store that are almost double in length from the normal toothpicks, and they worked perfectly. Some pieces did not come together as smoothly (one chicken breast had 4 toothpicks, whatever it takes to secure it. In a shallow bowl, season the cup of flour with the remaining 1/2 tsp black pepper, 1/2 tsp garlic powder, and dill weed. Stir to combine. In a second shallow bowl combine the eggs and water and beat with a fork until combined. Use a third shallow bowl for the dried breadcrumbs. Now you are ready to coat the bundles of chicken. First coat the chicken in the flour mixture, then dip in the egg, and finally roll in the breadcrumbs, making certain it is well coated. Place on a plate, repeat with other chicken pieces. Cover with plastic wrap and refrigerate 30 minutes to an hour. Heat the oil in a shallow fry pan over high heat. When the oil is hot, carefully add the chicken pieces to the hot oil (Careful as oil may splatter some). After a few minutes the bottom should be golden brown, this is when you carefully use a slotted spoon and a fork to turn the chicken over and fry until golden brown on this side. Remove to a paper towel covered plate and remove the toothpicks carefully. I like to hold a fork against the chicken as I pull the toothpicks loose so the chicken does not pull apart. Remove the paper towels and serve with lemon slices and parsley if desired. If you were successful at sealing in the butter, the garlic-y goodness will flow out onto your plate and you too may look at your spouse or guests and find them licking the plate with delight. The original recipe called for 1 tsp garlic powder and no paste, but I actually ran out of garlic powder while making this, so I used the garlic paste and it was a happy mistake! It’s delicious! Categories: Ethnic, Ethnic - Ukrainian, Favorite, Main Dish - Chicken | Tags: Chicken Kiev, Garlic, Garlic Chicken | Permalink.